Where was Annika dining in the Maldives? 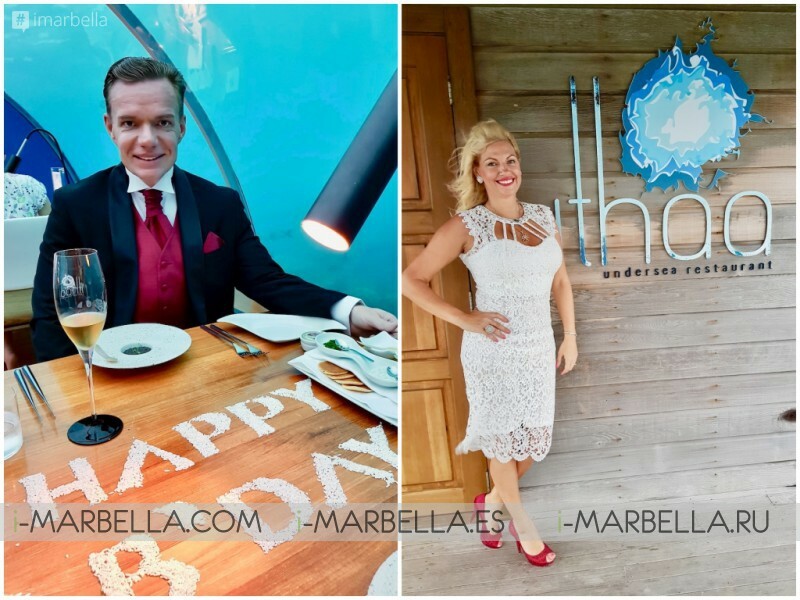 Ithaa Undersea Restaurant is the first underwater restaurant, a perfect place for any special occasions! 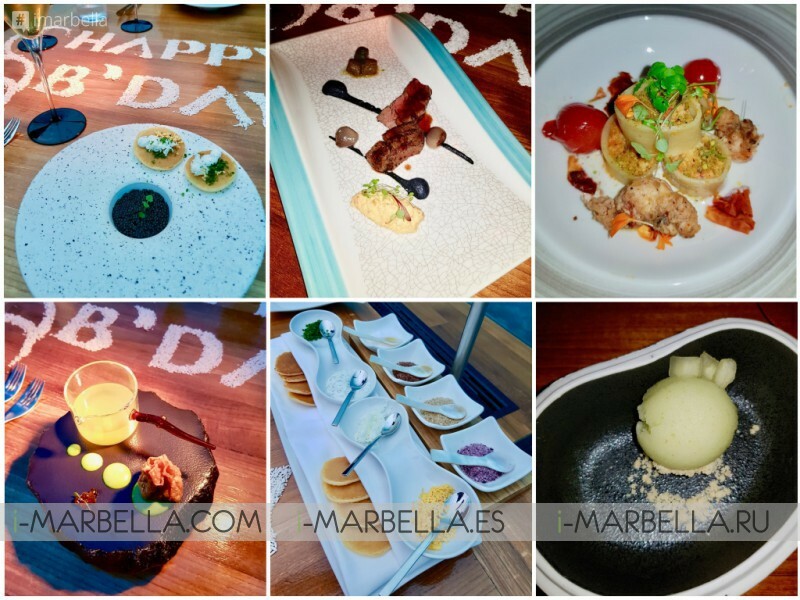 We went specially to celebrate his birthday five meters below the surface of the ocean with panoramic coral garden views and fusion menus matched with fine wines. Ithaa is the world's first and only all glass undersea restaurant. Conrad Maldives Rangali Island resort, which has been twice voted as the best hotel in the world. A multi-award-winning luxury in a once-in-a-lifetime destination. Conrad Maldives Rangali Island sets the perfect time! The Maldives needs no introduction as one of the most beautiful destinations on earth. The multi-award-winning Conrad Maldives Rangali Island resort- by www.i-Marbella.com Lifestyle Magazine agree to the TIME Magazine as one of the ‘World’s Top 100 Best Destinations in 2018’ and ‘Best Maldivian Luxury Beach Resort’ in the World Luxury Hotel Awards 2018. It is an idyllic island paradise, with lush tropical greenery and unparalleled views of the Indian Ocean at every turn. Experiences from island hopping to navigating aquatic gardens, swimming with whale sharks and undersea dining are all designed to showcase the breathtaking beauty of this once-in-a-lifetime destination. It is known for its underwater restaurant Ithaa. And also very known for the first underwater Villa called The Muraka. It has a bedroom and bathroom under sea level. This villa costs an incredible price of 50.000 USD Per night. Rangali Island is a convenient 30-minute seaplane ride from the Maldives’ bustling capital, Male. The resort has excellent facilities including a gym, two spas, tennis courts, and a dive center. The resort has 12 restaurants and bars. 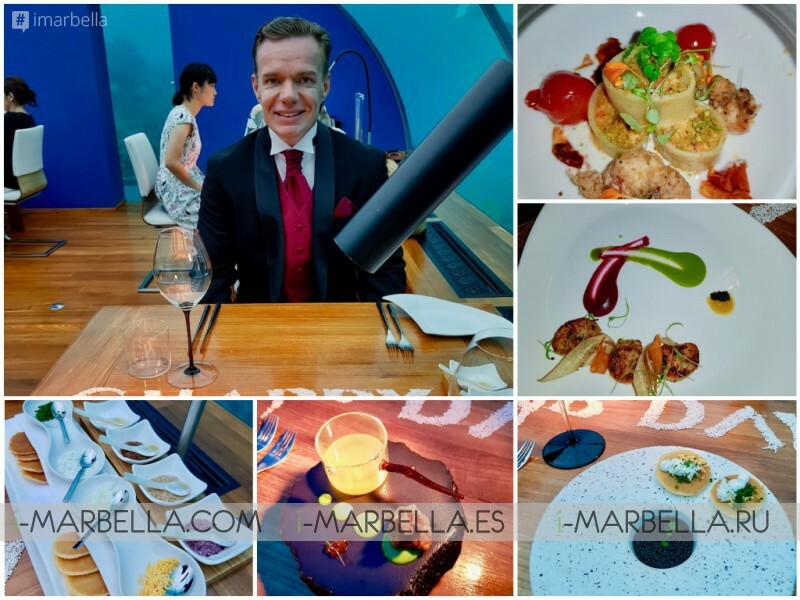 The most in-demand tables are in the Ithaa Undersea restaurant. The luxurious Conrad Maldives Rangali Island is built over two exotic islands, linked by a 500-meter footbridge across a blue lagoon and is home to the iconic Ithaa Undersea Restaurant. 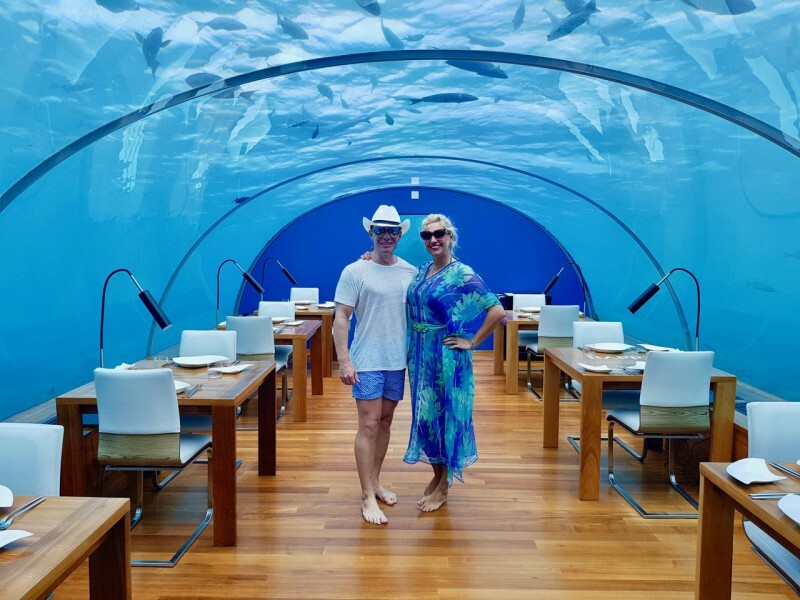 We stayed there 5 days and you can read our stay from the first blog: Annika's Blog: Conrad Maldives Rangali Island The Best Hotel in The World. This five-star resort welcomes guest to an Indian Ocean hideaway via seaplane. Enjoy of an in over-the-water, beach or spa retreat villas offering either the direct beach or ocean access. Ithaa Underwater Restaurant, Located five meters below the surface of the Indian Ocean, Conrad Maldives Rangali Island’s globally applauded restaurant Ithaa is the world’s first undersea restaurant, which offers 180° panoramic views of the vibrant coral gardens surrounding it. 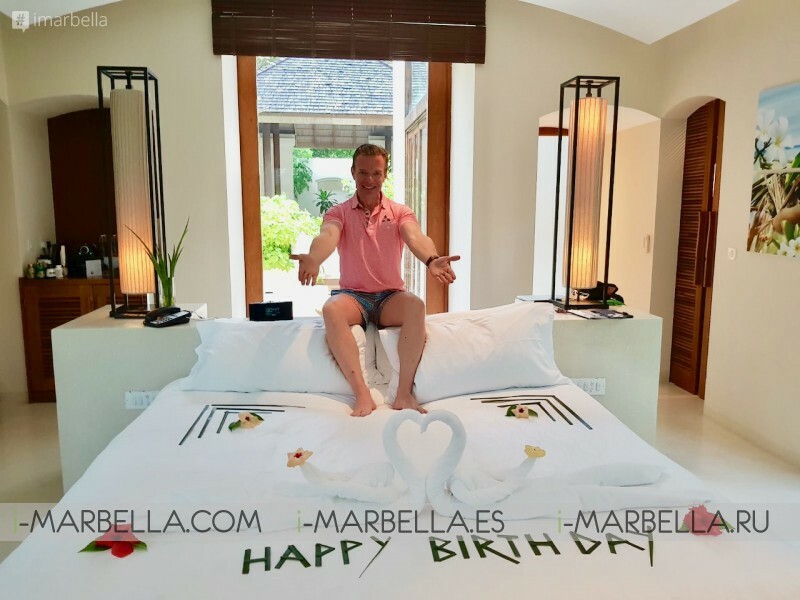 Birthday day was already special, the hotel surprisingly prepared a this for him. It was so cute and made Veiko certainly happy! We had a special birthday celebration for Veiko Huuse, my fiance! Defined as "mother of pearl" in Dhivehi, Ithaa is a crown jewel in Conrad Maldives repertoire of dining experiences, mesmerizing guests with a myriad of oceanic life and vibrant coral gardens encircling its magnificent interiors. Inaugurated in 2005, Ithaa was constructed in Singapore, then brought to Rangali Island, where it sits five meters below sea level on the seabed of the Indian Ocean, garnering acclaim as the world's first undersea restaurant. Dinner at Ithaa we had champagne in the waiting room over water. Into the restaurant, you can only go barefoot. Our table was set up with Birthday wishes on top of it from rice. It was so cute! Food and services were excellent! With cake at the end, whole stuff was singing Happy Birthday and we could come back the next day for pictures in daylight. Savor panoramic coral garden views and paired tasting menus. Thank you very much to the whole team for such an amazing dining experience!